Sean Feeney has designed bespoke furniture for every room in the house for both private and commercial clients across the UK and worldwide. From handmade bespoke tables and chairs to a vast range of stunning, yet practical storage and cabinets. Our bespoke bedroom furniture offers unique personal style for this most intimate of rooms. In some cases we are asked to design furniture for an entire room or wing. Often, individual pieces are designed to complement and link existing antiques in a room setting or unique period features and detailing. View the seven Guild Mark awarded pieces, the most recent of which was the Acer table that seemingly defies gravity and took over 200 hours to create. 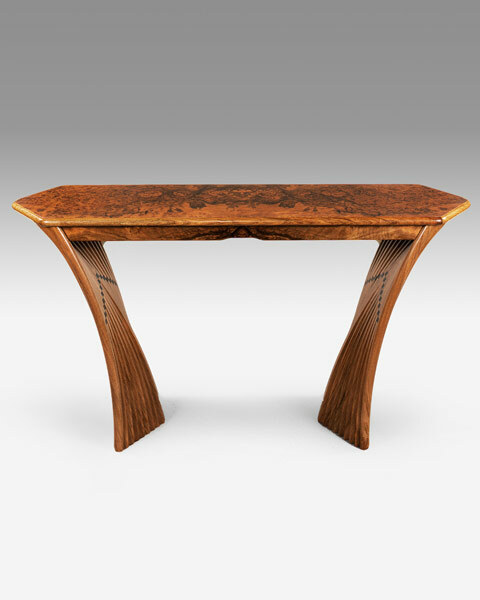 The design was originally commissioned in Walnut to complement and link two 18th Century antiques that were to be placed either side in a period home. Our price guide will give you an idea of the cost of our handmade furniture. Contact Sean Feeney to make an appointment to visit the workshop or discuss your ideas.